Due to people's overwhelming support in our first 4 months, I am pleased to now be able to offer 10 or 6 months interest free credit*. If you are waiting on insurance, probate, or your loved one's house to be sold, or basically if you don't want to pay the funeral costs out right, this would be just the thing for you. All you need is 1% deposit. For example, if the funeral will cost you £3000, you would pay an initial £30.00 deposit and 10 monthly payments of £297.00, based on 10 months interest-free credit. *Subject to credit check & status. There is £200 off pre-paid funeral plans until December. Debbie Bennett Independent Funeral Directors is not a lender. The lender is Braemar Finance which is a trading style of Close Brothers Limited. At Debbie Bennett Funeral Directors, we're here for you during your time of need. We walk you through all the steps you need to take when your loved one has passed away. Invest in a cost-effective method like a pre-paid funeral plan to put your mind at ease. We ensure that your funeral is arranged and fully paid for in advance of your death. Call 0151 426 3131 for personal yet professional funeral services. As independent, family-run funeral directors, we cover all aspects of funeral services and arrangements during those difficult times such as flowers, headstones, and even pre-paid funeral plans. Based in Prescot, Liverpool, we provide a caring and professional service to ensure your loved one is taken care of with the utmost respect and dignity throughout. 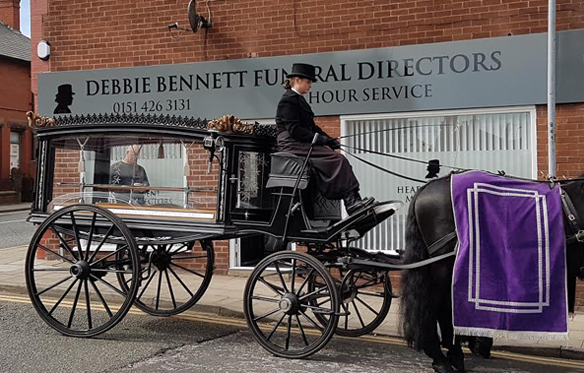 You can trust Debbie Bennett Funeral Directors for a caring and compassionate service. Contact us in Prescot, Liverpool, for more information regarding our funeral services and arrangements.